¤ Urinary tract infections cause misery for millions of women (20% are affected once a year) who are traditionally prescribed millions of courses of antibiotics. ¤ However, cranberry extract (Vaccinium microcarpon) can help maintain the health of the urinary tract naturally and reliably, with no side-effects. The health of the urinary tract is compromised when pathogenic bacteria stick to the internal wall of the urethra and cause cystitis. Cranberry contains an inhibitor which prevents the adhesion of bacteria to human tissue. This activity has been so well-documented that AFSSA (Agence française de securité sanitaire des aliments) has published an official opinion authorizing the claim: “helps reduce the adhesion of certain E. coli bacteria to urinary tract walls”. > contains other potent antioxidants which provide additional important benefits. 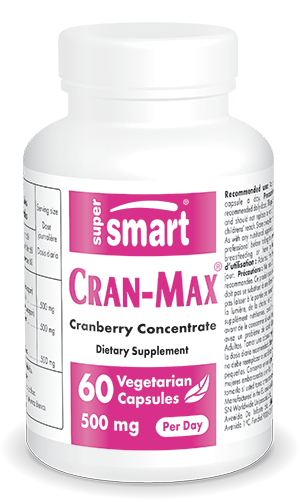 > Cran-Max® has been the subject of several clinical studies (including comparative studies with other extracts and with cranberry juice) which have clearly demonstrated its efficacy. Take one vegetarian capsule a day, at a convenient time.